When I got married, a kitchen scale was a “must have” on all the registry lists. I’d never used a kitchen scale before, but now I can’t imagine living without one (and I really can’t imagine how my mom always got on without one). In this article, I’ll discuss the value of having a small scale in your kitchen and some of the types of scales you can buy. Then I’ll take a look at some of the highest rated scales. You can skip right ahead to the Amazon listings for these options from the links in the table below to see the current price and reviews. Do You Need a Kitchen Scale? 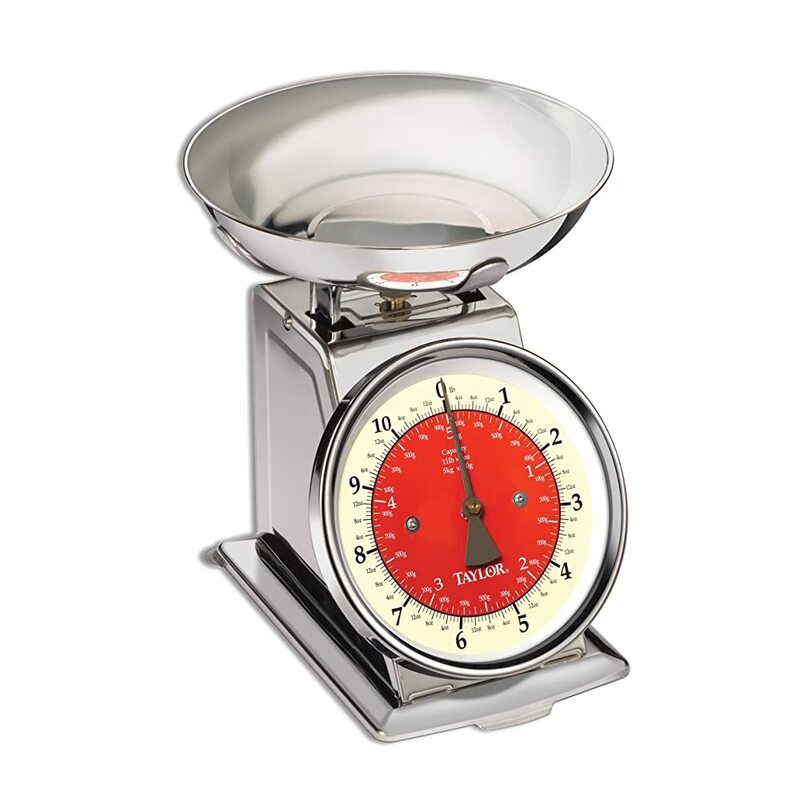 My scale is a big stainless steel mechanical number with a large face for the scale and a bowl that rests on top. I keep it right out on my counter and like to think it adds an “I really cook in here” vibe to my kitchen. Unless you want to “eyeball” and wing pretty much any dish, a scale gives you the precision to follow recipes accurately, which is especially important for baking. A scale is also a great tool if you’re on any sort of weight loss or healthy eating regimen to monitor your portions. Some people find other uses for kitchen scales, like weighing mail, and even weighing puppies and kittens! There are a few key differences in different types of kitchen scales, and some are better suited to certain uses than others. The primary distinction in kitchen scales is between mechanical and digital. Digital scales give you a digital reading of the weight of what you’re measuring. Some have additional functions like memory, a thermometer, etc. Digital scales can usually read smaller increments and are excellent if you want to measure out lightweight ingredients like spices. Digital scales are usually a flat plate or bowl with a digital screen at the front. Some have a very slim profile, which makes them easy to store. They can be made of plastic, stainless steel, or even glass. The drawback of digital is that as an electronic product, they may be more prone to failure than a simpler, mechanical scale. You must wash carefully. Consider also that most digital scales require batteries. Most mechanical scales have a dial face, and the scale mechanism is spring loaded. They’re usually made of plastic or stainless steel and often have a more old-time look to them. The measuring surface can be a flat plate or a bowl, and can usually zero out to accommodate whatever type of dish you want to use on top. The primary drawback of a scale like this is the size. They either take up a chunk of counter space or a healthy corner of a cabinet somewhere in your kitchen or pantry. They are also prone to losing accuracy over time as the components wear. Food bowl or platform: if you want to measure out wet ingredients, a scale with a bowl that’s easy to remove and clean will be easier than a scale with a flat platform. Unit measurements: Most scales give you the option of both metric and imperial units, but be sure first! The ability to calculate the tare weight: a tare button or dial resets the scale to zero after you put a bowl (or ingredient) on it. This is useful if you want to measure your ingredients into a container that isn’t part of the scale, and when you want to add multiple ingredients but measure the weight each time. Here I’ll discuss some of the top rated scales, both digital and mechanical, and the pros and cons of each. This sleek little digital scale is frequently recommended on Reddit and by bloggers, especially for portion control and dieting. There are many, many reviews of this product, the vast majority of them very positive. This scale has a circular, chrome finished weighing platform with an angled base for the buttons and screen at the front. It comes in 8 different colors and has a clear digital display on the front. This scale is simple and intuitive to use, and owners note that the tare button is wonderful so you can place a dish on top and zero the scale out for measuring the food onto a plate or bowl. Some people have tested the scale’s accuracy using gram weights and by and large have found it impressively accurate, especially given its low price point. One drawback some reviewers mention is that the placement of the screen means that a large dish may obscure it. Some users also have issues with this scale malfunctioning over time, or even after a few uses. Ozeri’s customer service seems to be quite responsive, though. It’s hard to say whether this is definitely poor manufacturing or just a result of the sheer volume of purchasers (some are bound to break). This digital scale is similar to the Ozeri, but has a very sleek, square design and an attractive brushed stainless steel finish that resists fingerprints. It’s one of Amazon’s top sellers. The slim profile makes this scale easy to store, and the flat platform would be useful for weighing oddly shaped items like mail. There are 4 precision sensors under the platform for accurate measurements, and I find this design would probably provide some protection against water infiltration when cleaning (although you definitely shouldn’t submerge it in water). Many people are very happy with this scale and use it for a huge variety of functions: baking, portion control, baby food, and pour over coffee. Owners note the modern design, ease of cleaning, and the simple functionality of this scale. Naturally, there are complaints. Some reviewers note that the scale will not read measurements below about 3 grams, which calls the accuracy into question. This is quite common, though, with average kitchen scales. If you need more precision, you should look to getting a scientific scale. Another complaint is that the backlight on the display shuts off after about 10 seconds. The scale remains on, but it is difficult to read the display at this point. Some people also find that the scale registers the weight of your finger when you push buttons, which can make the tare function especially challenging. This digital scale also has a huge number of positive reviews on Amazon. I love the look of this scale—sleek and modern but with a nod to antique-looking mechanical scales. Most people who’ve purchased this scale really love it. They find the design is modern and attractive, and the measurement is accurate. Some people find the platform is a bit small. Others have had issues with this scale malfunctioning. I also find that the “temperature” feature is a bit odd—it gives you the room temperature which is, I suppose, somewhat useful for baking, but it seems like more of a gimmicky sort of add-on than anything else. That is has a 1 year warranty and responsive customer support is definitely a bonus with low-priced electronics like this. This is a classic-looking mechanical scale, where the weight is measured on a large dial. It has a retro look to it, but can easily fit in with a modern kitchen, too. It’s big and not easily stored, so unlike most digital, this would likely stay on the countertop. This is the highest rated mechanical scale on Amazon. People find the build quality is nice, it’s accurate, and simple to use. Many people really appreciate the look and find it adds to the decor of their kitchen. A number of hunters approve of this scale, with one commenter appreciating that this scale won’t turn itself off after a short while as a digital scale would, which is disruptive when butchering. Those who had issues found that there is some attention to detail lacking, such as roughness to the metal rim around the dial. Others find that it’s not accurate enough for baking or giving very small, precise measurements. 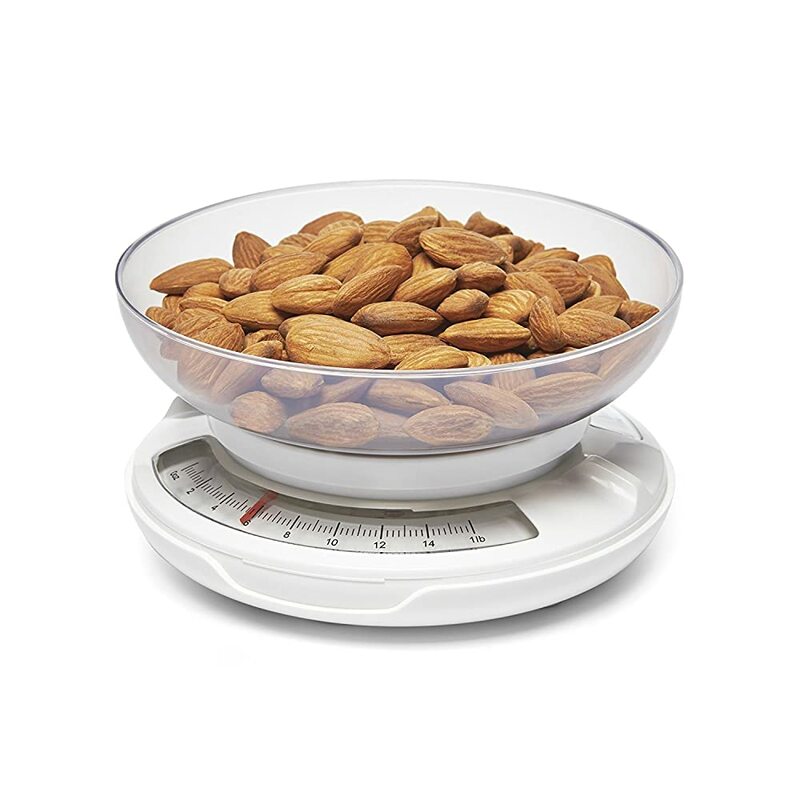 This little number isn’t really big enough for heavy kitchen use as it only measures to 1 lb., but if you want a scale you can take with you for portion control while eating on the go, this nifty little mechanical scale is worth a look! If you are in need of a kitchen scale and are trying to decide what to buy, consider first if you want a digital or mechanical scale. 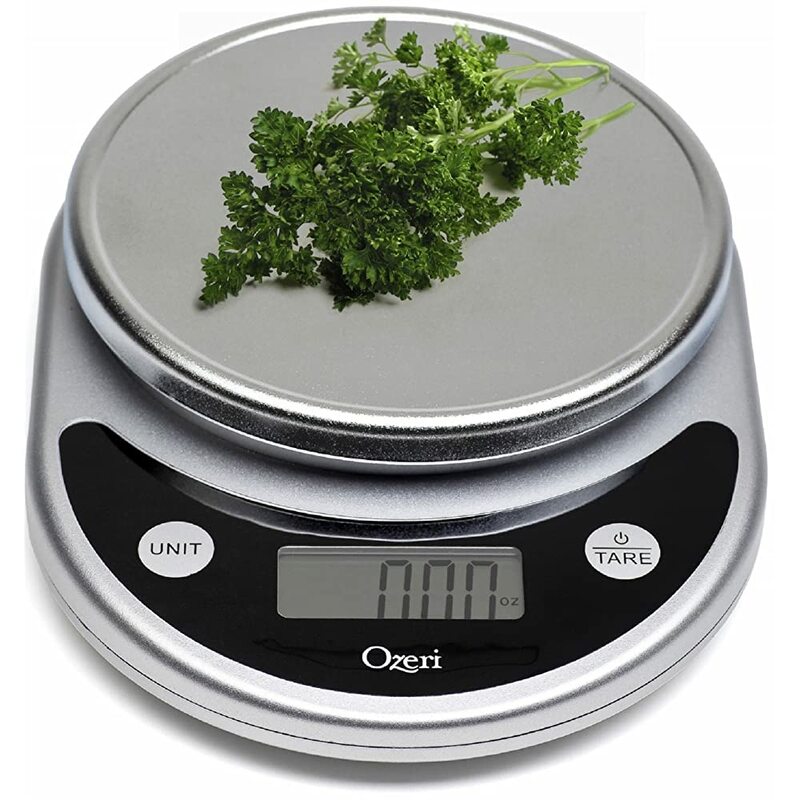 If you want to go digital, Ozeri’s highly recommended scale looks like a nice option that is accurate and reliable. If you like the classic look of a mechanical scale you will display on your countertop, Taylor’s Stainless Steel scale is a good choice. 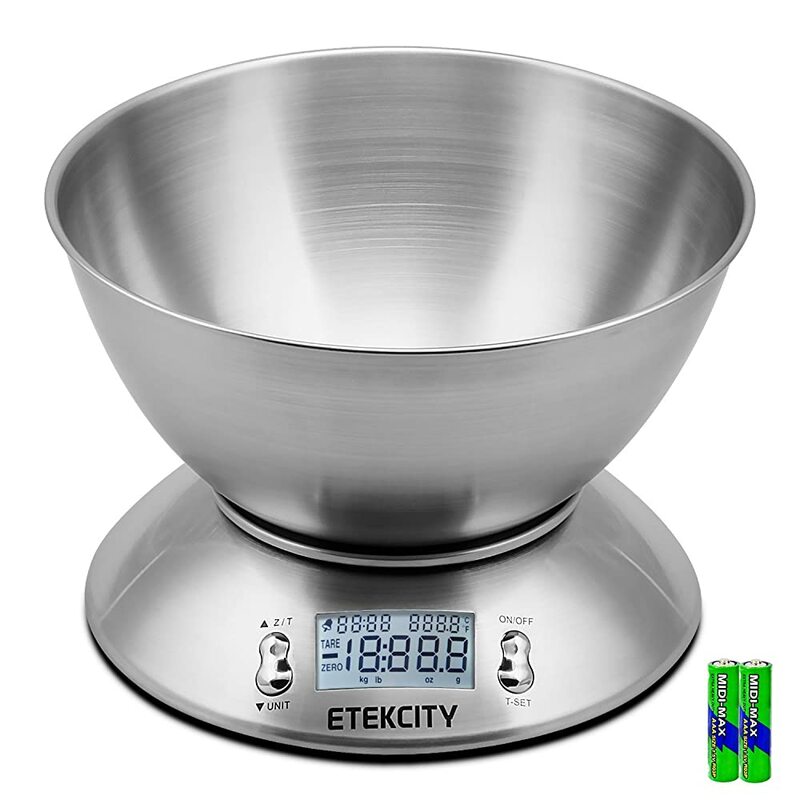 I think Etekcity’s digital scale with the bowl offers the best of both worlds. I love a scale with a bowl, but having the accuracy of a digital scale is definitely a big plus. 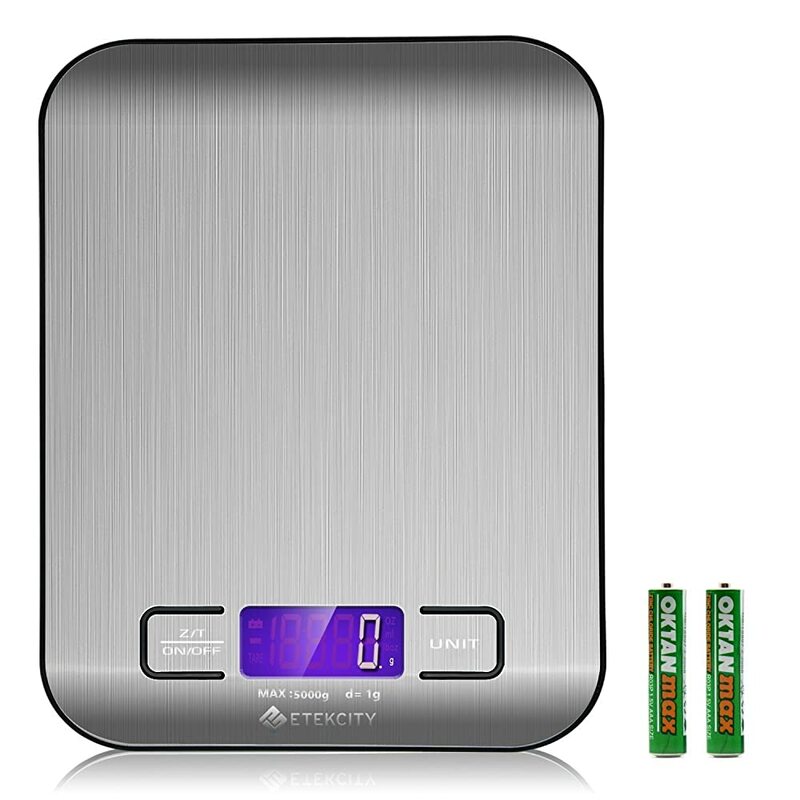 I really, really love my mechanical scale but I think I’d actually go for the Etekcity’s scale if I had to buy one today! Do you use a kitchen scale? If so, what type? Let us know in the comments!